The TWG Model food flavor granulating drying machine is highly advanced, using leading technology. 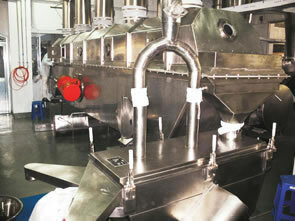 It uses a mixer, wet-method granulator, continual producing dryer, separating sieve, and more. It is suitable for granulating, drying, and sieving chicken essence, fungus essence and many other flavorings. This line utilizes a continuous, enclosed production process and automatic feeding and discharging, in order to avoid any cross-contamination. Simultaneously, the food flavor granulating drying machine uses a composite type heating system and a cooling system at the end of drying chamber, so as to achieve the desired effect. A CIP system can also be fitting into the drying chamber. 1. The food flavor granulating drying machine offers continuous production, composed of formula mixing, granulating, continuous drying, finished-product classification sorting, and packing. It uses an enclosed production process in order to eliminate pollution by the production environment or any cross-contamination, which improves the environmental health requirements of the production of foodstuff and medicines. 2. The food flavor granulating drying machine uses a continual-motion, dynamic drying mechanism. It achieves high productivity with high thermal efficiency. The use of hot air percolation and circulation technology further reduces energy consumption. With a special heating system, the drying equipment can offer heating temperature according to the material's moisture content, thus ensuring uniform water content of end products. 3. According to customers' requirements, screens are replaceable, and different sizes of products can be made. 4. The food flavor granulating drying machine has temperature monitoring in each drying section, and it can regulate the rotating speed of the belt accordingly. 5. A CIP system can be fitted in the main drying machine, making it convenient for cleaning the equipment. 6. This line uses an interlock system and excessive temperature alarm function, in order to avoid the potential safety hazard of violating operation and exceed temperature, which insures safety in production. Note; The experimental material is the Φ0.6 chicken essence, initially the moisture content is 8% , the end product water content is no more than 3%. Note: The data given above varies in accordance with the specific use. The data is only for reference.